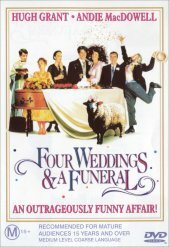 Whilst this is a movie that most of the public would have seen before, chances are more than once as well, Four Weddings and a Funeral never fails to delight me with it's sheer charm. Presented to us in a full screen format as opposed to widescreen, this movie follows a man named Charles (played by Hugh Grant) as he quite literally attends four weddings and yes indeed, even a funeral. Charles is a decent man who is incapable of properly expressing his emotions to those he loves and after becoming smitten to Carrie (Andie McDowell) with whom he spends a night of lust, we follow him and his friends through the course of aforementioned weddings and the extremely sad funeral. It's funny but this is the movie that I would have to say made Grant an international star and the first five minutes is spent with him saying the magic F word, as is everyone else! I must confess that I spent almost every couple of minutes guffawing my way through this movie, it is truly that funny in a cringing way. I always get a real kick out the way the Grant stutters and stammers with his characters and in this feature, his timing is absolutely excellent. Rowan Atkinson as the priest in training is hilarious, as he is always. It's a top film from start through to the very end and I had a blast watching this one. The film is transferred quite well despite the lack of widescreen, however the picture quality is very good and clear. The strength of the film and sheer ability of the story and actors makes this film and it's for that reason I must confess that I really didn't care too much about the apect ratio. It's not the sort of film that requires you to see "everything" to get the most enjoyment out of it. Audio is in Dolby 2.0 and I couldn't see a moment when the film would have benefited from a full 5.0 mix. The only weak point on this wonderful DVD was the extras which quite frankly were ordinary and disjointed. They were fun to watch but appear to be more of an afterthought than a real effort to provide this disc with a bit of extra material. This film deserves to be in your collection and as such I suggest that you give it a try.